The Emmanuel Art Gallery is a team of hard-working students and staff. We are a strong and committed community striving to bring visual art to the Auraria Campus, downtown Denver, and Colorado. Jeff Lambson is the Director and Curator of the Emmanuel Art Gallery at the University of Colorado Denver. 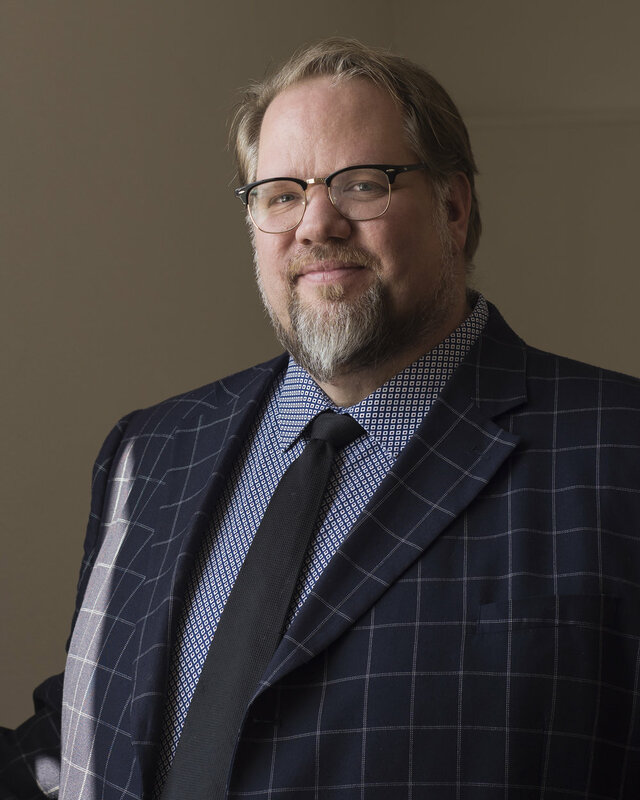 Prior to his position at CU Denver, Jeff was founding Curator of Contemporary Art at the BYU Museum of Art, the most-attended university art museum in North America. He began his arts career at the Smithsonian Institution’s Hirshhorn Museum and Sculpture Garden in Washington, DC, the nation’s museum of modern and contemporary art. Lambson has curated many acclaimed exhibitions, including Mirror Mirror: Contemporary Portraits and the Fugitive Self; The Matter of Words; We Could Be Heroes: the Mythology of Monsters and Heroes in Contemporary Art; Think Flat: Andy Warhol and Takashi Murakami; No Place Like Home; Gabriel Dawe: Plexus 29, Jann Haworth: Never The Less, and many others. Lambson is the recipient of the Salt Lake City Mayor’s Award for Service in the Arts, and was named by Salt Lake Magazine as one of Utah’s most significant people of the past 20 years. His work has received publicity in W magazine, Art Ltd, Artforum, Sunset, PBS, and BBC’s The Culture Show. Jeff is married to Ann Lambson, Interpretive Specialist for Architecture and Design at the Denver Art Museum, and they live in Denver with their precocious daughter. Neftalí Pazo is an undergraduate at University of Colorado Denver doing majors in both Trans Media Sculpture and Painting. He is planning to pursue his masters after graduation and become an art dealer. As a practicing artist in different mediums, he worked with collectives like Ex-Manolo among others in San Juan, Puerto Rico. Four years ago he decided to come to Colorado to pursue his education in sculpture. He currently works on shows and commissions for collections. Sharifa Moore is currently an undergraduate student at the University of Colorado at Denver. She is pursuing a BFA in photography and a BA in Art History. Sharifa is an interdisciplinary visual artist utilizing photography and installation into her practice. Her work explores topics of confinement and womanhood. She is a Colorado native living in Evergreen. Tomas Bernal is film and television production major at the University of Colorado Denver. He is a Colorado native from Pueblo, Colorado and spends his spare time in street photography. His ultimate dream is to work in comedy. Katherine Hazelton is a Digital Design Major and plans to graduate in Spring 2019. She plans to pursue a higher degree upon graduation abroad in Paris, France. While sticking to computer design as an art form, she also expresses herself through an amazing fashion sense and photography. She currently works for the College of Arts and Media as a digital designer in conjunction with her Emmanuel gallery internship.